We had the opportunity to stay in one of Bangkok’s newest and trendiest hotel during our weekend shopping getaway in the city. 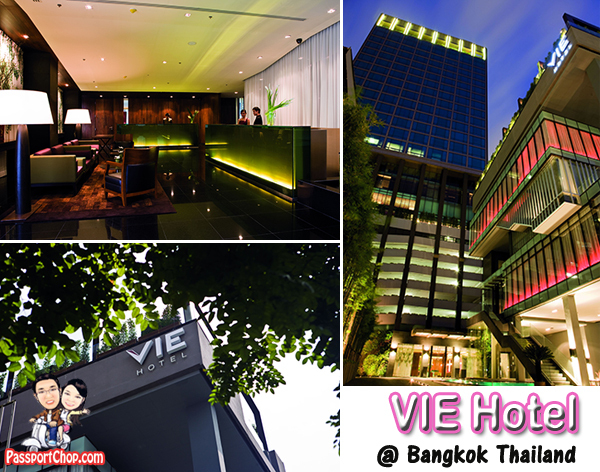 It is evident why VIE Hotel Bangkok is fast becoming one of the most popular and leading boutique hotel in Bangkok. VIE Hotel Bangkok has only been opened for 2 years since December 2008 and it has already won awards and accolades from top travel portals, magazines e.g. “Trendy in Asia” by Tripadvisor Travelers’ Choice Award 2010, Wotif.com Best Newcomer in Bangkok, “Best Urban Hotel of Asia-Pacific’s Most Notable Debut list” of DestinAsian-Asia’s Travel Magazine and the list goes on. Thus if you are looking for a hotel that cares about providing great service as well as comfort and style through its aesthetically-pleasing, cutting-edge room design and building architecture, VIE Hotel Bangkok should be your top choice. VIE Hotel Bangkok targets different travelers through its selection of unique city and hotel experiences – from the VIE Bangkok City Experience which offers guests BTS Skytrain day pass and tickets to explore Bangkok to the VIE Business Experience which aims to provide business travellers with easy connectivity through in-room Wi-Fi and networking opportunities through VIE Lounge access. We tried out one of VIE Hotel Bangkok’s most interesting offer during our stay – the Deep Sleep Package. This product offers a methodical plan of activities and elements to ensure relaxation and sleep preparedness – essentially helping you to sleep well (as the name of the package suggests) during your stay here. This unique experience begins at the very moment we checked-in – one of VIE’s Sleep Consultants (they are trained in the art of sleeping the right way!) provided a personal check-in service at our VIE Deluxe Suite room on the 27th floor (each of VIE Experience comes with an accommodation upgrade to VIE Deluxe Suite Room). Our VIE Sleep Consultant provided recommendations and advice on the best sleeping position, meditation and muscle relaxation activities, suggestions on sleep-friendly meals and how to create an environment that soothes the senses of sight, scent, sound, taste and touch for the ultimate sleeping experience. We learnt quite a fair bit on the use of aromatherapy in relaxation and how different scents affects your mood prior to sleeping. The next highlight of our stay was definitely the VIE Deluxe Suite – with an area of 81 sqm, it is almost the size of a three-room HDB flat in Singapore. The Suite comes with a spacious living area with a 8-seater sofa and state-of-the-art entertainment system and LCD TV, as well as a comfortable bedroom (own separate TV) with floor-to-ceiling windows which offers a great view of the Bangkok city skyline. There were even green tea sachets and a CD with relaxing music and sounds (those sounds of bird-chirping, waterfall, river flow) available in our room to help calm us down after a hectic shopping day in Bangkok – all part of the Deep Sleep Package – check out our pictures at PassportChop.com Facebook page on these amenities. To get an idea of how comfortable and spacious the VIE Deluxe Suite room is, check out the video below, which showcases the various areas (living area, bedroom, vanity and bathroom) in the suite. 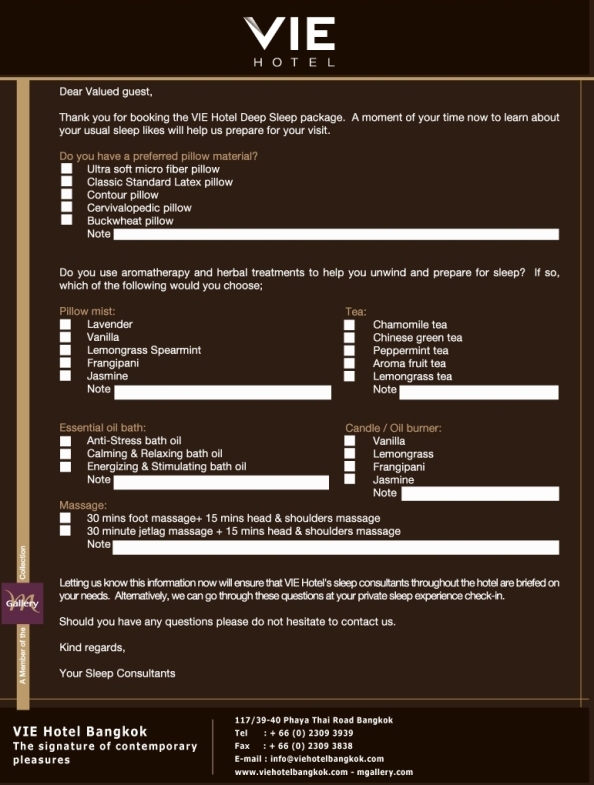 To prepare for our Deep Sleep package, we were emailed a questionnaire a week prior to our arrival in Bangkok, to indicate our preference for pillows, VIE Bath amenities setup and the VIE Spa massage. If you don’t know the difference between an ultra soft micro fiber pillow and cervivalopedic pillow, there is even a sample pillow box in the room for you to feel and understand the differences. Don’t worry about the choices of pillow mist and essential bath oil – your Sleep Consultant is always available to help you with your selection. As part of the Deep Sleep package, we were also treated to a complimentary 45-minute relaxation treatment in the VIE Spa (meant to help relax our body and still the mind). Our treatment included a 30-minute Jet Lag Massage + 15-minute Neck & Shoulders Massage. The Jet Lag massage reduces water retention after a long haul flight. This comprised of leg and back massage (to release muscle tension) and foot massage (designed to help improve circulation in the legs after a flight). We didn’t quite suffer from jet lag (since Singapore is only a 2-hour flight from Bangkok) so we postponed our Jet Lag massage to the second night. This massage was just as effective in treating tired legs after a whole day of shopping in Platinum Mall, Pratnuam Market and Chinatown (more on our shopping experience in another post). The foot massage in itself completely brought me to a deep slumber and reportedly, I even snored during my short nap on the table! Truly first class massage job provided by the skilled masseurs of VIE Spa. Breakfast is served from 6.30am onwards at the VIE Wine and Grill and the selection of food was just incredible and felt almost like a lunch buffet – there were local delights e.g. mee hoon, fried rice, with dishes e.g. spicy Thai pork and beef as well as sausages and various types of vegetables. 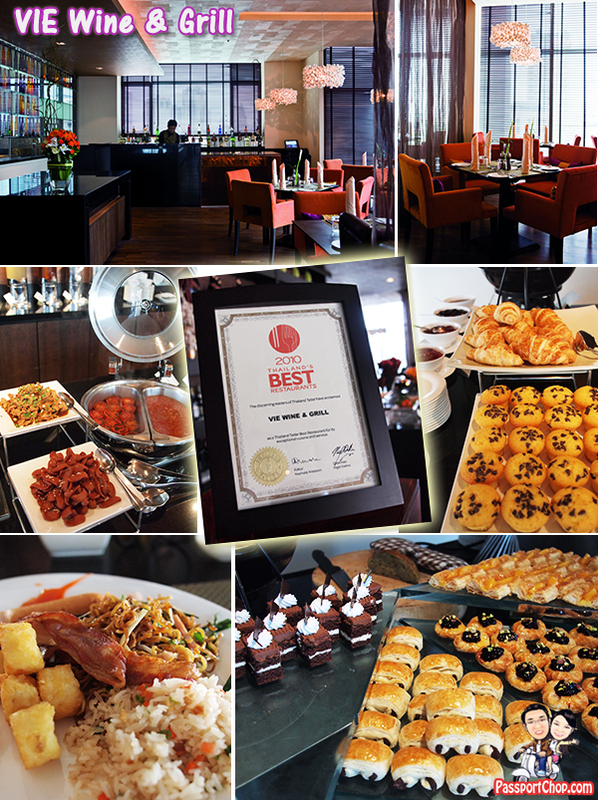 The dessert and bread counter itself were overflowing with cakes and muffins of different flavors. What’s really amazing was that they changed the menu daily (or at least for the 2 breakfasts we took at VIE Hotel Bangkok) – we were all familiar with hotels which provided the same food items everyday but this was not the case for VIE Hotel! The rice and noodles were prepared in different ways and the vegetables were cooked in different styles with different sauces and condiments. Even the cakes and muffins were of different flavor from the day before. The Grand Breakfast at VIE Wine & Grill won hands-down for its presentation, variety and taste and not surprisingly, VIE Wine & Grill was awarded as a Thailand Best Restaurant 2010 as well as Thailand Best Restaurant 2011 for the exceptional cuisine and service, voted by the discerning readers of Thailand Tatler Magazine. If you are considering the VIE Hotel Bangkok for your next shopping getaway or business trip to Bangkok, you can find out more details on the hotel at http://www.viehotelbangkok.com. VIE Hotel Bangkok room rack rate for Bed & Breakfast starts from 5,100 Baht nett (inclusive tax and service charges) but there are usually promotions offered at the VIE Hotel Bangkok Accor Hotels reservation site: http://www.accorhotels.com/gb/hotel-6469-vie-hotel-bangkok/index.shtml. For example, the latest Hot Deals for VIE Hotel Bangkok as of date of posting (8 Mar 2011), was 2,520 Baht and Stay 3 Nights for the price of 2. 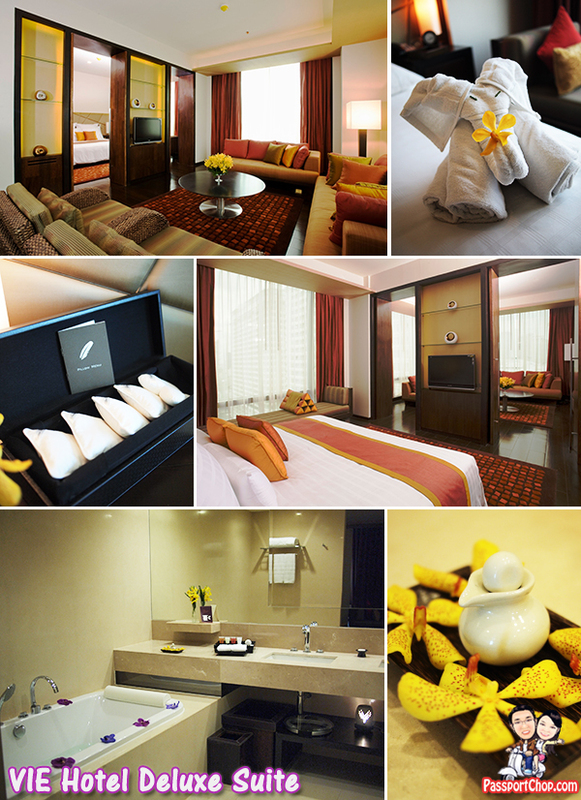 Another plus point for VIE Hotel Bangkok is its excellent location right in the heart of the dynamic Bangkok landscape. It is just an easy 3-minute walk from the Ratchathewi Skytrain station. The taxi fare from the airport to VIE Hotel is approximately 360 Baht (inclusive of expressway tolls and airport surcharges) and to get to the heart of Bangkok’s shopping district – be it the high end shopping experience at Siam Paragon, Central World, MBK or the fashion outlets at Platinum Mall and Pratunam Market, it is only a short 6-minute (longer if caught in a traffic jam) taxi ride (metered fare of 40 Baht). 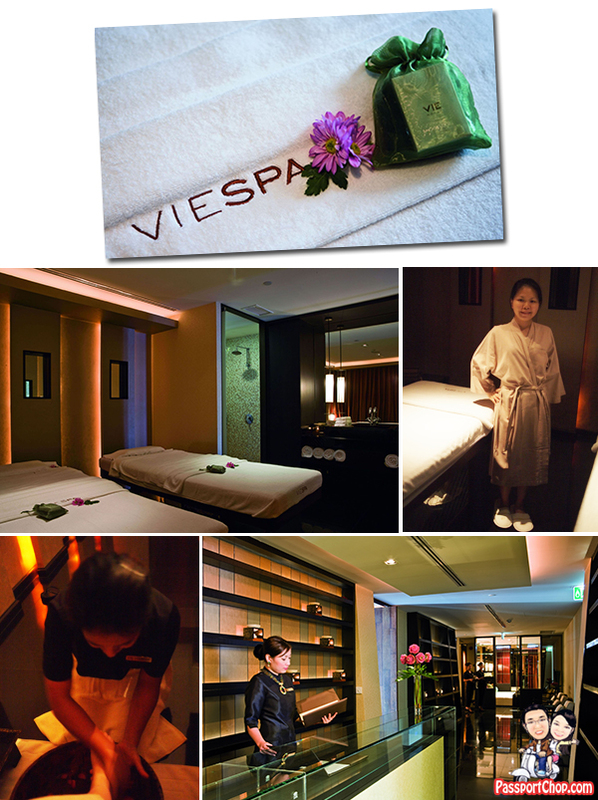 PassportChop.com’s Deep Sleep Package experience was sponsored by VIE Hotel Bangkok. Wow!! Very attractive hotel plus great hospitality. I haven’t been in Bangkok as yet but looking to visit over there. It’s a modern city with great attractions. Thanks for the detailed review and recommendation. Planning for a vacation in Bangkok during the coming school holidays and this helps. Bangkok is the one of the finest places to visit as if ensures too much fun and lots of attractions that can make us wonder.